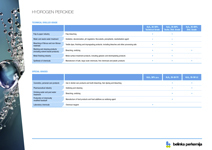 Hydrogen peroxide | BELINKA PERKEMIJA d.o.o. 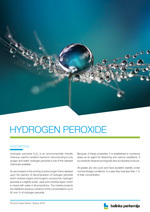 Hydrogen peroxide H2O2 is an environmentally friendly chemical, used for oxidation reactions. Decomposing to only oxygen and water, hydrogen peroxide is one of the cleanest chemicals available. Its use is based on the working of active oxygen that is released upon the reaction of decomposition of hydrogen peroxide which oxidizes organic and inorganic compounds. Hydrogen peroxide is a slightly acidic, clear and colorless liquid, which is mixed with water in all proportions. The market products are stabilized aqueous solutions of the concentrations up to 60 w/w % of hydrogen peroxide.